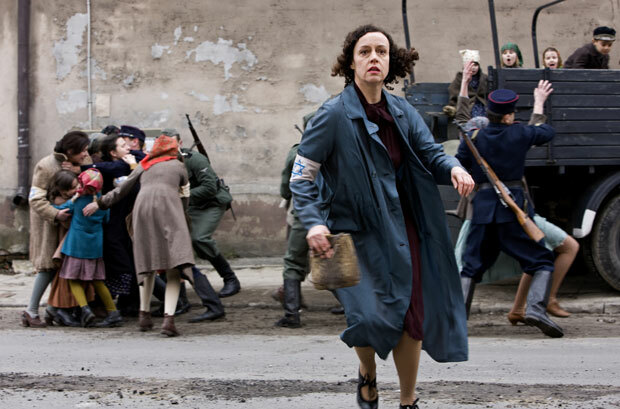 In Darkness is a film directed by Agnieszka Holland, adapted by David F. Shamoon from the non-fiction novel In the Sewers of Lvov written by Robert Marshall. 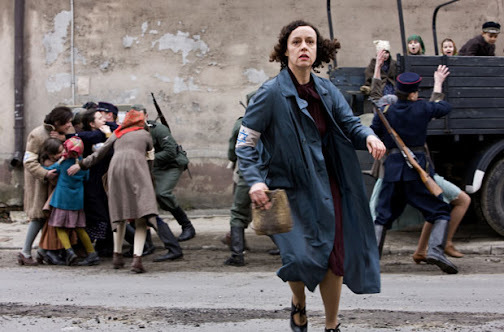 It premiered at the 2011 Telluride Film Festival, and was nominated for Best Foreign Language Film at the 84th Academy Awards representing Poland. Based on the true story of Leopold Socha (Robert Wieckiewicz), a sewer inspector and petty thief who by chance encounters a group of Jews fleeing from the ghetto and sensing a lucrative opportunity he agrees to help them for a price. Not unlike Christian Bale's character in his recent film The Flowers of War, Socha has a change of heart after witnessing brutal atrocities, and ends up helping the group for good instead of greed. With Jolanta Dylewska's sharp handheld camera and minimal lighting provided mostly by flashlights, Holland does an excellent job of capturing the horrifying and claustrophobic feeling of being trapped in those dark and dingy sewers for 14 months. We really get a sense of just how awful those rat infested tunnels and passageways were, or at least as close to that feeling as you can get on screen. Veteran Polish actor Robert Wieckiewicz handles the lead role well, as the reluctant hero who decides to risk it all for the well being of strangers, and the rest of the ensemble cast do their best to bring life to the thin characters they are given to work with. However, as remarkable as this story of survival happens to be, and as skillfully directed, lensed, and acted the film is, it simply could not persuade me to shed this constant feeling I had while watching it, that this was just another rehash of the same old tale. It's also hampered by the fact that most of the characters here were basically cliches who are put through some obviously contrived dilemmas in order to achieve the greatest dramatic effect. Adding to that is a running time that pushes two-and-a-half hours, I can't say it ever gets to the point of boring, but it does become somewhat of an ordeal to sit through. Yes those were terrible times and those were terrible events, but every educated person already knows this. We've also seen, read, and heard better versions of this story before. So despite all of its strengths, it's hard for me to see In Darkness as much more than a shameless attempt at Oscar baiting. Great review! I wondered from the trailer if there would be anything really new here, and it sounds like there's not, at least from a story angle. Would be interesting to see the different shots with the underground hiding places. Thanks for covering all of these! Pity. It could be interesting. Oh well. Cool review... shame it didn't quiet live up to its potential, but as you say there are loads of films covering the same kind of ground. I've been watching all your reviews of the films nominated for best foreign film, and I've noticed that almost none of them have impressed you to the point of "give that film an award right now!" Given the wealth of phenomenal films there are to choose from, I have to ask about these choices? The cynic in me instantly assumes the academy is terrified of drawing attention to too many excellent foreign films so they choose one (A separation) and then just go for slightly above average for the rest of them. I'm sure that is a naive suggestion on my part... but i am still wondering about how these choices are made when there are SO many brilliant films out there.. It does have an interesting look to it, but yeah it's yet another holocaust picture. I'm glad the Academy made the right choice for once! I did think it was a good film, just not nearly special enough to be The Best. The biggest problem with this category is that each country's respective academies are only allowed to submit a single film to represent them. Countries with insignificant film industries like Kazakhstan, Mongolia, Egypt, or Bolivia (no offense intended) get the same representation as major players like France, Spain, South Korea, and Canada. So there are always a ton of excellent titles who don't even get a chance, and also a ton of mediocre ones who are in by default. It doesn't matter I guess except that a wider audience might watch if they win. Still, the winner in this category this time was a good one, so that's a relief. This is the first time since 2004, the year I began following this category closely, that I actually agree with the winning film. Oh and do you have any useful tips to become a more interesting and popular blogger? As for tips, I don't really know how to be more interesting, I just cover and write about the things that interest me, and if a few people find that interesting as well, then cool. To be more popular, it's pretty simple but a lot of work. What I do is find, follow, and comment on a wide variety of blogs, participate in the LAMB events, and post in the forums. People will start noticing you and reciprocate if they like what you are doing. Successful bloggers are generally friendly, helpful, and supportive people, avoid the one's who aren't and copy the ones who are. Perhaps taking part in LAMB events is the way to go. I comment on a variety of blogs myself. Some never come to my blog though haha. I think I'll give this one a miss, it all sounds so predictable, and done better before. No, they aren't perfect saints and heroes, but they still all fit the typical archetypes for this genre, and the Nazi's are all one dimensional monsters.